This is my 76th Thanksgiving. Some, I do not remember. In fact, as a young child, I think my family did not always gather for Thanksgiving. But once I married and had my own home, Thanksgiving became my favorite holiday. I love the autumn colors—the oranges, golds, rusts, and reds. I love the cornucopia filled with fruit and nuts. I love the Community Thanksgiving service in which churches across our town gather in one church or another to express thanks and praise to God. I love my extended family gathering for a feast that lasted well into the evening hours. But most of all, I love what Thanksgiving stands for: gratitude. And in recent years, this special day has been squeezed between Halloween and Christmas with barely a nod to its significance. Stores and shops are already twinkling with lights and Christmas bangles on trees. In our town, Open House for Christmas has already happened. Many individuals have decorated trees and strung lights across rooftops. Not me. I’m waiting to savor this special day of turkey, dressing, cranberry relish, pumpkin pie. But most of all, I look forward to s sitting around the dinner table with my loved ones. I admit not every Thanksgiving has been like this; a few times, we’ve celebrated this special holiday in different ways and my Thanksgiving apron has hung in different places. One Thanksgiving, we were on a tour in Mexico. (We did not have turkey and dressing!) Another time, we both worked for amazon.com in Coffeyville, Kansas, and spent half a day on the job before enjoying a festive meal provided by our employers. We shared tables and foods with friends we had never before met. Another year, Lee worked at amazon.com in Campbellsville, Kentucky, and we shared a potluck with new friends and co-workers. 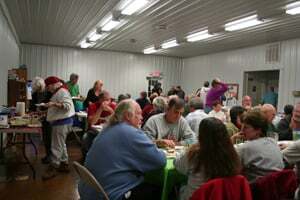 We’ve had several occasions to share Thanksgiving with Lee’s large extended family in Tennessee cities. 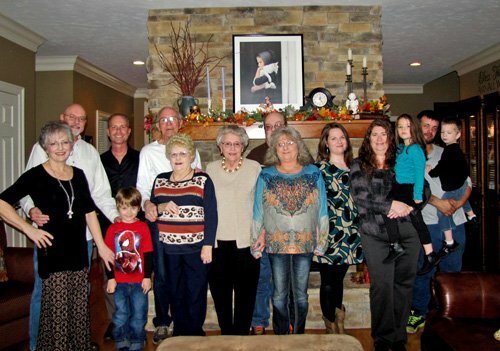 But largely, Thanksgivings have been with extended family in Heber Springs, rotating from year to year between my home and my cousins’ homes. Then things changed; some of our family left us for a Heavenly Home. Cousins married and established traditions of their own. The number at my table shrunk to accommodate my immediate family. And this year, my 76th Thanksgiving, is totally different. I have cancer—an unwelcome and unexpected guest. I cannot host my family around my dining table. My Thanksgiving apron hung limp, not worn this year. However, my older daughter and her husband picked up the tradition. On Thanksgiving Day, we gathered around their dining table in their beautiful home perched on a bluff overlooking Little Red River and Greers Ferry Dam that holds the water back in an expanse of clear blue water. For the first time in my adult life, I was only expected to be present. I did not prepare the dressing, the pecan pie, or the turkey breast. 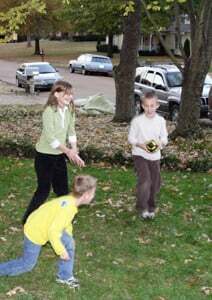 But I am so thankful to have one more Thanksgiving with my loved ones; three little great-grandchildren who keep the holiday lively. A nephew and his wife traveled from Northwest Arkansas to be with us. Thanksgiving was a special day—one in which to give thanks to our Lord. Hopefully, next year, I can once again take my Thanksgiving apron from its hook and help to prepare our feast. Praying for many many more Thanksgivings for you whether they be in Heber Springs or another of the exciting places you will travel. You are an inspiration to us all, and I always enjoy your journaling. I always enjoy your stories. I wish you many more Thanksgiving with your family. You are an inspiration to others. God Bless.